Continental is a developer – of careers and communities – and our success in developing valuable real estate is dependent upon successful career development and career fulfillment for our co-workers. Our work is not easy but the collaboration within our company, the drive for new ways of accomplishing our tasks efficiently and professionally, and our culture of open debate, challenge and resolution are the means by which we accomplish difficult work and overcome challenges. As a result, we make a difference in people’s lives, and not only in the lives of the people of Continental and our families. We make a difference in the lives of our residents and the customers at our retail and hotel properties. We impact the livelihood of the thousands of people who build and support our developments. We add to the liveliness, vibrancy and health of the communities where our properties are located. Congratulations to each member of the Continental Team. 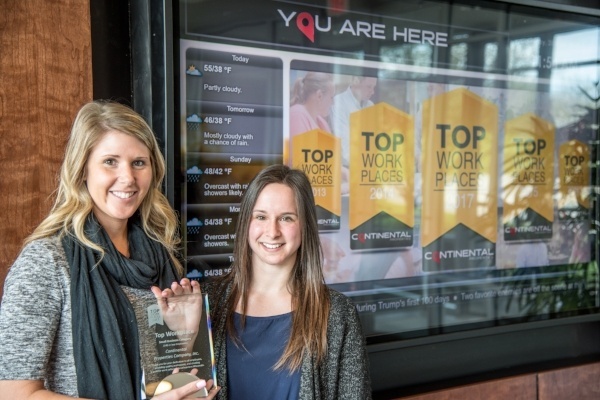 This recognition of the workplace you have created strengthens our success as a magnet for the best and the brightest! Thank you for all that you do each and every day to make our company a truly exceptional organization.